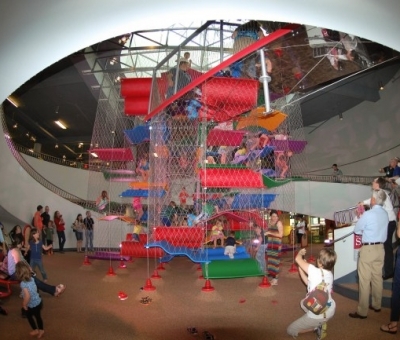 In November of 2013, Productions Unlimited, Inc. was approached to undertake the redesign and installation of the Climber at the Children’s Museum of the Upstate. Productions Unlimited, Inc. welcomed the chance to utilize our expertise on such a unique product. Throughout the months that followed we took on the challenge as we removed the existing structure and designed, manufactured, and installed a brand new climber. 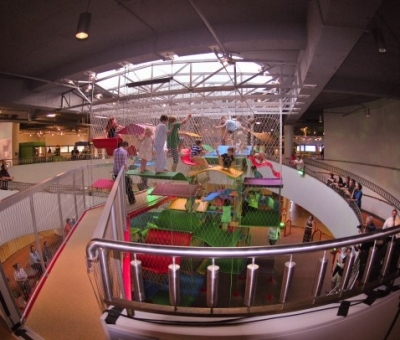 The design was particularly challenging in that we not only needed to come up with a concept as unique as the Children’s Museum, but we also needed to find the right plastic product to do the job. The plastic needed to be more durable and reliable than the last product for the new structure. After much research Productions Unlimited, Inc. determined the best product for the new structure would be our very own polyonyx+ performance flooring. It was the only plastic which gave us the long lasting durability, texture, and flexibility we needed to help our design come to fruition. Once we settled on a plastic for our panels, the next step was to custom mold and color each panel into creative shapes that reflected the museum’s official colors. Our design included 60 panels divided into six custom color groups to match the museum’s theme colors. 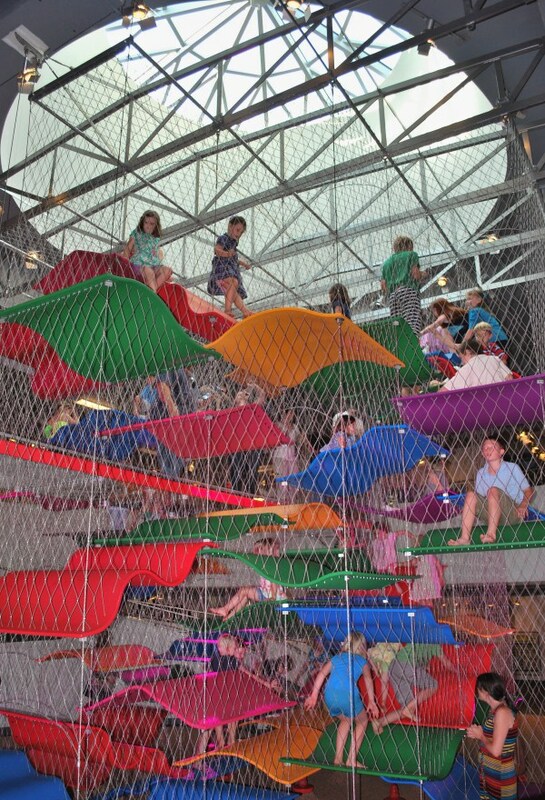 We utilized Line-X Protective Coating to give each panel the proper color and non-slip-grip to keep the structure safe and fun for the children at the Museum. Each color group was also given a distinct shape to bring interest and complexity to the structure. Productions Unlimited, Inc. built a custom oven for molding the flat plastic sheets of polyonyx+ into the unique shapes that were called for in the design. After the panels were molded and coated, the installation began. The project took 2,300 labor hours to install and many of those hours were dedicated solely to creating the wire safety mesh that encased the structure. Productions Unlimited, Inc. utilized 22,500 feet of clear 1/8” wire rope and 25,000 zinc plated steel clips to create the safety mesh. The mesh was woven into a diamond patterned, The design was aesthetically pleasing and also, increased the structural integrity of the wire rope and panels. 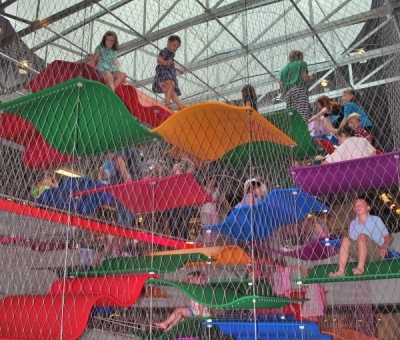 The intricately woven wire rope was essential to ensuring the safety of the children as well as maintaining the artistic aspect of the design. Our final product was a huge success. 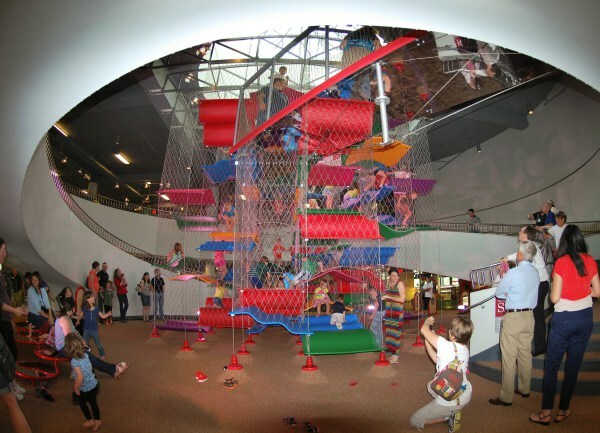 During the unveiling of the climber, on May 7th, many museum members were able to enjoy the custom creation from Productions Unlimited, Inc. 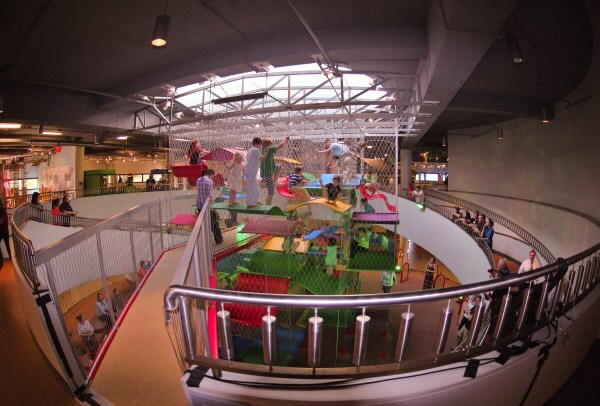 The Climber is now open for all visitors of the Children’s Museum of the Upstate to enjoy during their visit.